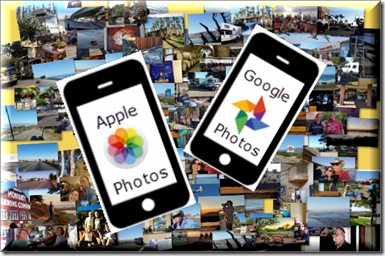 Macintosh – Learn Picasa and Google Photos! If you use an iPhone, you are in the Apple world, and it seems logical to use the Apple photo solutions: Apple Photos and iCloud Photo Library. But, you also have the option to use the Google solution called Google Photos. Have you been getting frustrated with constant messages by Apple that your iPhone is FULL, or that you need to buy more iCloud space? Or are you simply confused about how your iPhone works with iCloud and your Mac or PC computer? Then you owe it to yourself to take a look at Google Photos. And, if you have an Android device, Google Photos is the logical choice. I am a Google fan-girl, and I use Google Photos for all my photos. I use an Android phone and Windows computer. I also have an iPad, an iPhone, and a Mac computer so that I can test how things work and be able to help people who use the Apple ecosystem. 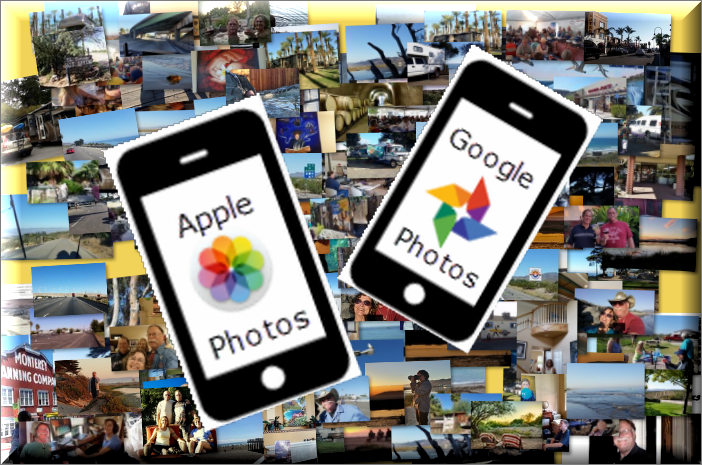 After using Google Photos for the year since it was released, and exploring the Apple iCloud system throughout that time, I think I’ve come up with the fundamental differences. First let me tell you how they are alike, and a little about how they work. Apple’s iCloud supports iOS, Mac, and PC, but not Android. Google Photos supports iOS, Mac, PC, and Android. So, if you have an Android device that you use to take pictures, Apple’s iCloud solution is off the table. Apple’s iCloud Photo Library cannot delete from device. If you delete a photo from any device using iCloud Photo Library it is deleted from every other device. There is one exception – if you have installed iCloud Photo Library on your Windows computer, it will receive all new photos added, but will not remove photos deleted from elsewhere. In other words, there is no “Sync’ing” with iCloud photos on Windows after the initial download of the photos. Google Photos allows you to delete photos from the mobile device that took the picture, while leaving the photo available in the Cloud. Apple: Apple uses the Cloud as a service to keep devices in sync. You can see the photos by going to iCloud.com, but you can’t do anything with them there. Google: Google uses the Cloud as the end game. It is where all our our photos collect and live forever. You can edit and create with them there. Apple Apple uploads your original size photo and allows you to shrink the copy left on your phone. Google Google allows you to shrink the photo that is uploaded and leaves the copy on your phone untouched. You can then delete the phone copy to free up space. I prefer Google’s method since it takes less bandwidth to upload smaller photos online. It also means that your web photos will be faster to view and use. Google’s compressed size is called “High Quality” and it maintains up to 16 Megapixels of photo quality while compressing the file size by about half. These are plenty good enough quality for family memories, you can print a good 8X10. If I really want to keep the original, I can use another method to copy my original photos. Either another cloud service like OneDrive, DropBox, or Amazon, or use a USB cable and copy the photos to my computer. Apple gives you 5GB of free iCloud storage space. That fills up quickly with full size photos. For only $1/mo you can purchase 50GB more. That is certainly cheap enough – I don’t mind pay the $1, what I mind is having to pay attention! Google gives you unlimited Free storage for photos IF you use the “High Quality” size discussed in #4 above. The High Quality unlimited free option is our recommendation. If you choose to upload your original quality photos, they will count against your 15GB of free Google storage. To buy more, is $1.99/mo for 100GB. Apple iCloud sees your Mac computer as another sync’ed device as long as you have iCloud Photo Library turned on. Add a photo from any device and it adds to every other one, delete a photo from any device and it deletes from all. The Photos App has a version that runs on the Mac – so your Mac computer is like a mobile device in the way Photos works. You can, however specify original sized photos to be used on the Mac. Windows computers have a version of iCloud Photo Library which will download the pictures, but there is no Windows version of the Photos app, so there is no synchronizing. Google Photos only sees computers as a source of photos, computers are not sync’ed devices. You can upload photos from a Computer to the Google Photos library in the Cloud, but the connection ends there. Deleting from the library or from the computer will not delete from the other. Editing a photo on either side will not update to the other. You can also download photos from your online library to your computer. If you use Picasa on your computer, you can download Albums from Google Photos, you can also use Picasa’s Sync tool to keep them synchronized. If you agree with me that Google is the better option, the next question is: How do I get my pictures from Apple’s iCloud Photo Library to Google Photos? You can Install the Google Photos App on your iPhone or iPad and turn on Backup and Sync. Assuming you have iCloud Photo Library turned on, this will upload your complete iCloud Photo Library to Google Photos. It starts with your earliest photos and works its way to the present. In my test it was able to upload 400-500 photos per hour. Of course, your mileage may vary especially depending on your Internet connection speed! I question, however, if using your mobile device is the best way. If you have your iCloud Photo Library set to “Optimize iPhone Storage” then you might be letting Google Photos upload reduced size photo files. And Google Photos is adding its own compression as well. When I experimented with this procedure, the photos did not seem to be extra small. They looked fine. Some were 600K, but some were 2MB. I have no way to definitively know what is happening here. But, if you can, it would be better to upload from a Mac’s Photo Library where the iCloud setting is for Original size rather than optimized. If you are a Geeks On Tour member, we have a full series of tutorial videos on Google Photos. Here are the videos for just getting started. Notice that there are a few labeled *Free, meaning you don’t need a membership to watch them. In case you haven’t heard, iPhoto is going away. Apple is putting all your photos into one basket called simply, “Photos.” It will no longer be offering either of its current photo management tools, iPhoto or Aperture. The iPhoto App on the iPad is already disabled if you upgraded to iOS 8. The Macintosh version will wait till sometime next year when OSX Yosemite is released. I can’t find any information on whether you will still be able to use the iPhoto you currently have, or whether it will stop working like on the iPad. 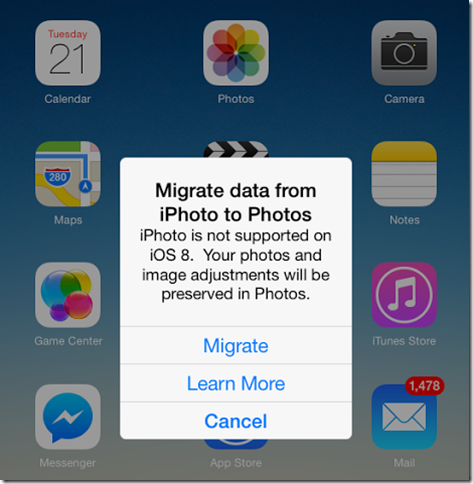 Of course, Apple is providing a migration path to its Photos app and, with full integration of iCloud Photo Library, I expect that this is going to be a very good option. It sounds a lot like Google+ Photos actually, especially the Auto Backup part! I recommend following this procedure now just to be sure that your pictures are not held hostage by iPhoto. You see, iPhoto keeps all your pictures in its proprietary library structure. If you look at your Mac’s folders and files (using Finder,) you will only see one – very large – file for your iPhoto LIbrary. All your pictures are inside that ‘package’ and you can only view them using iPhoto. Picasa, on the other hand is not a container for your photos. It is a tool for viewing, organizing, and editing that works with the individual .jpg files in your computer’s filing system. So, this process of “migrating from iPhoto to Picasa” is really just copying all the pictures out of your iPhoto library and putting them into folders where Picasa – or any other program that works with .jpg files – can see them. This tip, and the whole website PicasaGeeks.com are brought to you by Geeks on Tour. We’ve been teaching Picasa since 2004 and have nearly 100 tutorial videos available in our Learning Library.